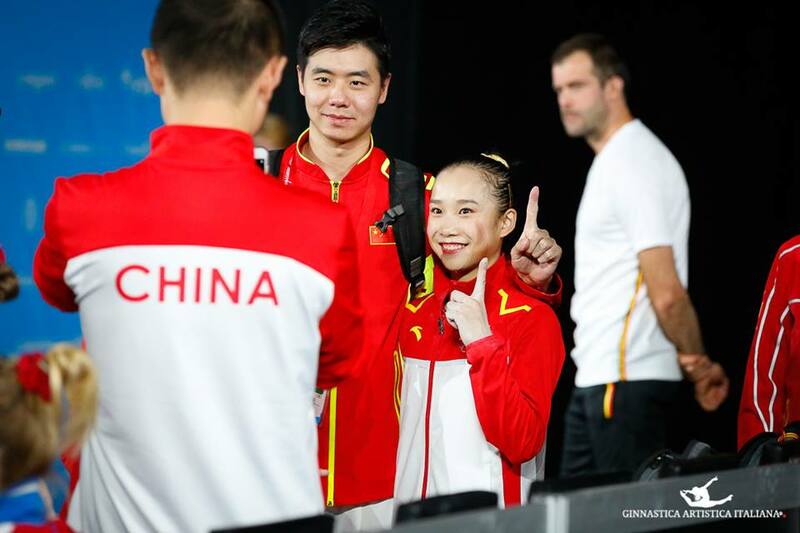 Articles by "Gym Skills Guide"
At the 2017 World championships, which was held in Montreal last October, eight skills were submitted by seven gymnasts. Five of the eight skills were successfully performed hence were added to the CoP, most of which were on the uneven bars. *Note: Sugihara successfully competed the skill in the all around competition but no footage of it was available. Brasil's Rebecca Andrade submitted her full and half twisting double back tuck on floor (G) but had to withdraw from the competition after tearing her ACL. Sugihara submitted a two and half Y turn on beam but did not compete it. Dutch Sanne Wevers submitted a two and half turn with leg below horizontal (E) but also did not compete it. In 2017, gymnasts had to successfully submit and perform their skills at the World championships in order to have it named after them. However, starting from next February, gymnasts will be able to get their skills named after them at any of the FIG official competitions. According to the current rules, if more than one gymnast competed the original skill, it will be added to the CoP bearing no name. Nevertheless, the Ricna half was named after both gymnasts, Nina and Georgia. By next February, if more than one gymnast competed the same skill, it will be named after all of them. During Szombathely Challenge Cup which was held this month, Romanian gymnast Catalina Ponor was judged very harshly on balance beam. 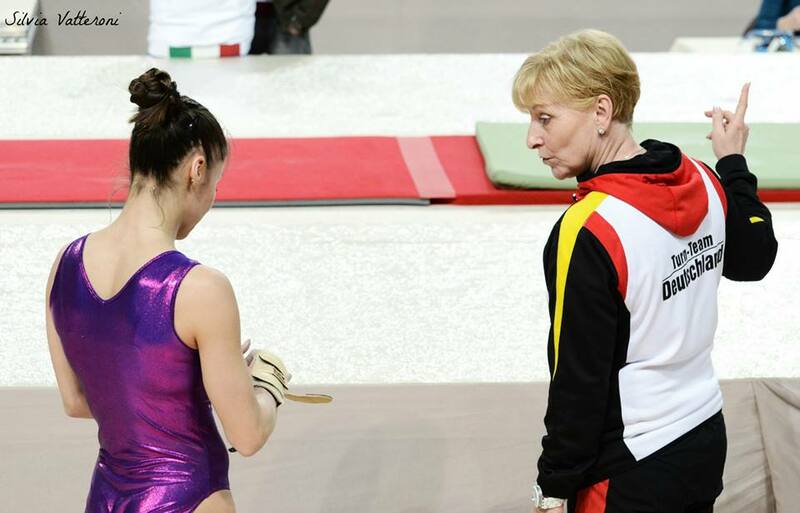 The recent European beam champion went for a 6.5 routine and judges awarded her with only 5.6. They downgraded her ring skills and did not credit her with several of her acro dance connections. An overwhelming amount of people called the judging harsh and unrealistic. Little do they know that things will get even more complicated starting from October. So in case you did not see our previous article where we explained why Ponor had her routine severely downgraded, you need to check it out before scrolling down. Ponor had her split ring jump downgraded from a D to a C as per before October rules. D acro to D dance is worth 0.2 connection bonus, while D acro to C/B dance is worth 0.1. 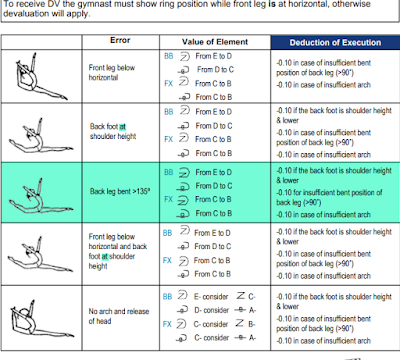 Since the split ring jump, which was downgraded to a C, was connected to Onodi - Ponor received 0.1 bonus. ِAs per post October rule, her split ring jump (D) will be credited as a regular split jump (B). In this case, the connection bonus would be the same (0.1). 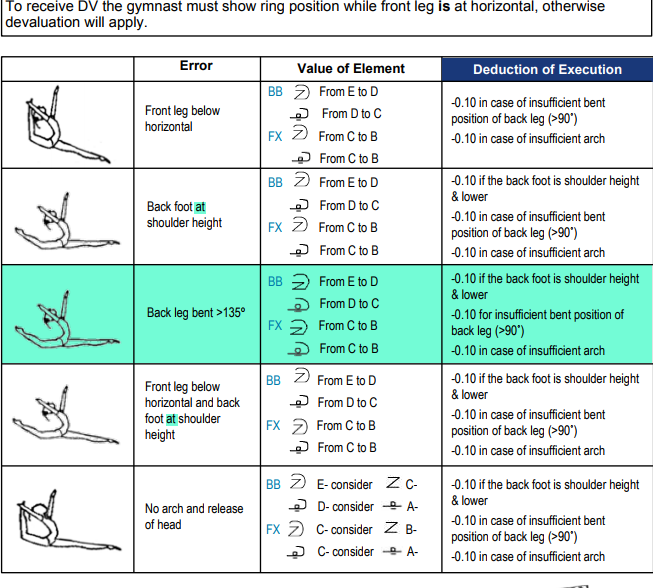 and the rule states that gymnasts cannot perform the same element for series or connection bonus. So if she was credited with the connection bonus of both Onodi to split ring jump and front aerial to split jump in the before October rule, she would only be credited for one connection in the post October one. 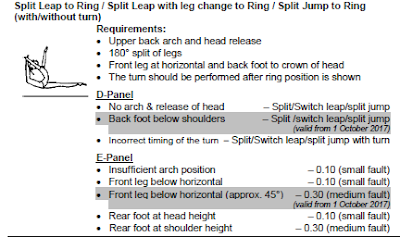 Ponor's E rated switch ring leap was downgraded to a D. As per post October rule, her switch ring will be credited as a switch leap (C), which was already included in the routine. Gymnasts cannot get credited twice for the same element. Both the switch ring and switch leap were among the top counted dance elements for the Romanian gymnast. Hence if her routine was judged in accordance to the post October rule, she would have either received a 5.0 D score or a 4.9 one. 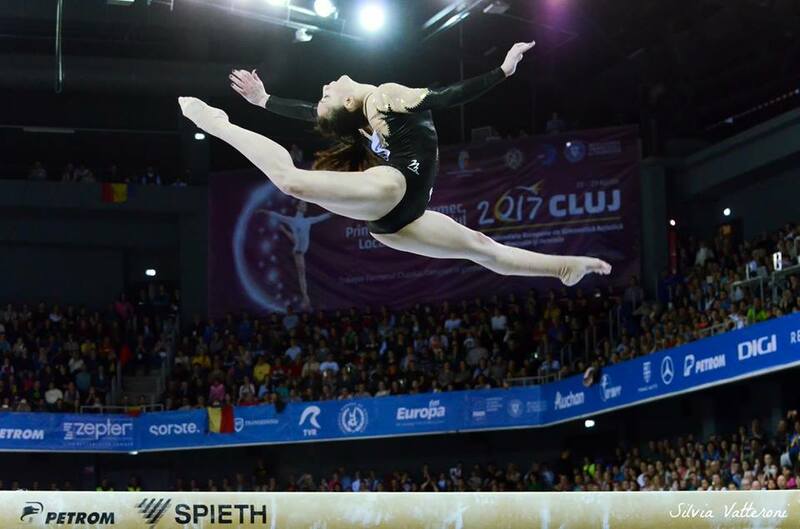 While participating at the 2017 Szombathely Challenge Cup, Romania's Catalina Ponor had her beam routine severely downgraded by the D score judges. Ponor intended for a 6.5 routine but received a 5.6 in the difficulty panel. In this post, we have done our best to break down the intended D score and what might the judges have credited or not have credited. Back layout to two feet mount, F.
Back handspring (B) to LOSO (C) To LOSO (C), 0.1 connection bonus - 0.1 series bonus. Switch leap (C) to Kochetkova (D) to Stretched jump 1/1 (C), 0.2 connection bonus - 0.1 series bonus. Onodi (D) to split ring jump (D), 0.2 connection bonus. Forward aerial (D) to Split jump (B) to Omelianchik (D), 0.2 connection bonus - 0.1 series bonus. Wolf jump (A) to Sissone (A). 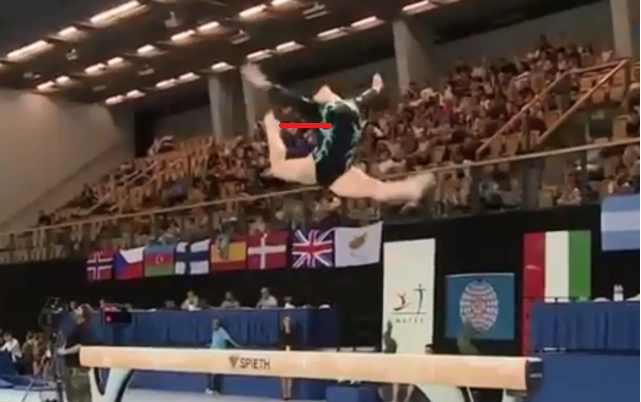 There is no such a thing called stretch jump with half turn, so the skill and its connection to Kochetkova were deemed invalid. So here she loses the 0.1 connection between switch leap to Kochetkova, the 0.1 connection between the Kochetkova and stretch jump 1/1 and the 0.1 series bonus of switch leap to Kochetkova to stretch jump 1/1. *Her split ring jump was not rightfully executed. The code states if the back foot is below the shoulders, the split ring jump (D) gets downgraded to (C), hence, the connection bonus goes down from 0.2 to 0.1. *Her back foot was below the shoulders on her switch ring leap (E), hence the value of the skill was downgraded to a D.
hence also loses the 0.1 series bonus. or the onodi and split jump for the additional arm swing thing. or downgraded her F rated layout mount to E rated back pike. Three elements were submitted and successfully performed in 2016. Gymnasts need to submit and compete their skill at Olympics, Worlds or Youth Olympic Games in order to have it named after them. However, that year FIG made an exception and accepted to add a skill and have it named after a gymnast at the Test Event. This is our third understanding the 2017-2020 CoP article where we will explain the changes on floor exercise. 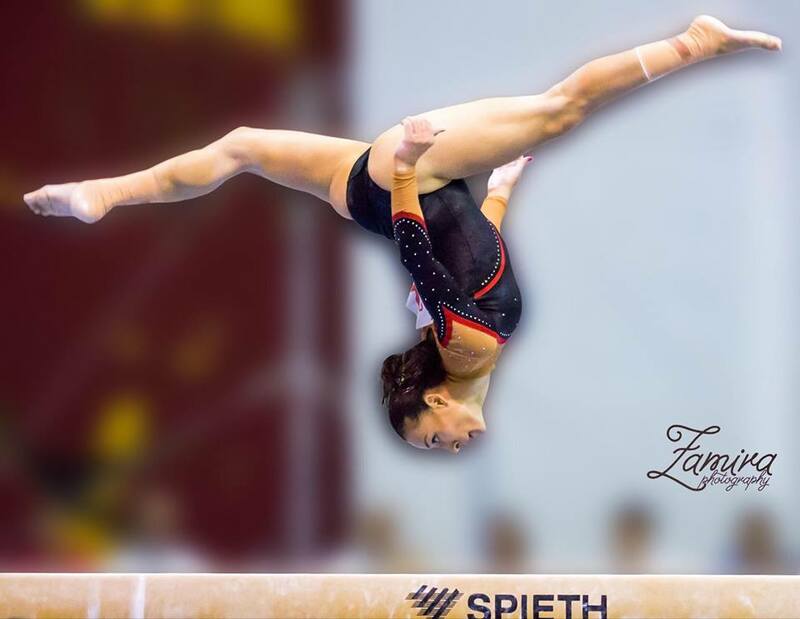 If you missed out on our first two articles, you can click here for our first article which was on balance beam and here for our second one which was on uneven bars. Before we explain to you the specific changes on floor exercise. We'd like to mention these two very important new rules. Please note that these rules are a general one not on a certain event. However, we chose to mention it here since floor exercise will be the only apparatus to be affected by it. If a gymnast competed a quintuple turn, the judges will consider it quadruple. Personally, I don't like this, the sky should always be the limit. The FIG does not like having gymnasts build up their difficulty score by doing dance skills. But the difficulty of dance elements is already capped at an E, hence, it doesn't make any sense for them to put a limit to it. The only reason for gymnasts to compete more difficult turns is to have it named after them, thanks to the FIG that would not be happening. Second: Gymnasts can a connect a turn to the same exact one and be awarded for double difficulty (leg below horizontal are excluded). For example: a double Y turn to a double Y turn. One of the four composition requirements has been modified: gymnasts should do backward and forward/sideward salto (NO AERIALS) in an acro line. So what does that mean exactly? In past the quads, gymnasts who had difficulty in competing forward tumbling, included a simple forward aerial or a side somi in their floor routines to fulfill the requirement of doing a forward/sideward salto. The deduction of standing on two feet in the corner more than once is gone. which means that a gymnast cannot include those two skills in her routine and expect to receive difficulty value for each. The same goes with switch leap 1/1 and Johnson 1/1. You can click here for more. Arabian double salto stretched has been upgraded from a G to an H.